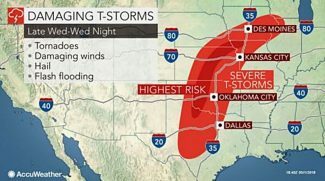 AccuWeather reports lives and property will be at risk over part of the central United States as the risk of severe thunderstorms, flash flooding and isolated tornadoes peak during the middle of the first week of May. People are encouraged to review their severe weather plan of action if they have not recently done so. Have an emergency kit with vital medicines, first aid, toiletries, flash light, etc., prepared. Be sure to keep your cell phone charged and enable audible alerts to receive severe weather bulletins. Through Wednesday, the most likely time for violent storms, including tornadoes, is from 4 p.m. to 11 p.m. local time. However, some potent storms will occur earlier by day and linger later at night. Scattered thunderstorms from Tuesday afternoon are likely to ramp and increase in coverage during Tuesday evening. The area at risk will extend from west-central and northeastern Kansas to southeastern Nebraska and southwestern and north-central Iowa. A narrow zone of isolated severe storms will also extend southward into western Oklahoma. The storms Tuesday evening may produce damaging wind gusts and large hail as well as flash flooding. A couple of tornadoes cannot be ruled out from the strongest storms. On Wednesday, the risk of severe thunderstorms is forecast to extend from near the Big Bend area of Texas to northwestern Illinois and the southwestern corner of Wisconsin. Storms with large hail, damaging wind gusts, flash flooding and isolated tornadoes may occur anywhere in this zone. 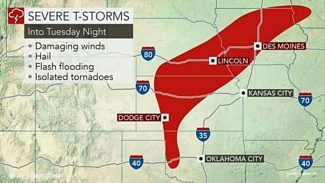 "The most likely area for tornadoes is in part of western Oklahoma as well as to central and northeastern Kansas on Wednesday," according to AccuWeather Lead Storm Warning Meteorologist Richard Putnam. The most likely time for violent storms, including tornadoes, is from 4 p.m. to 11 p.m. local time. 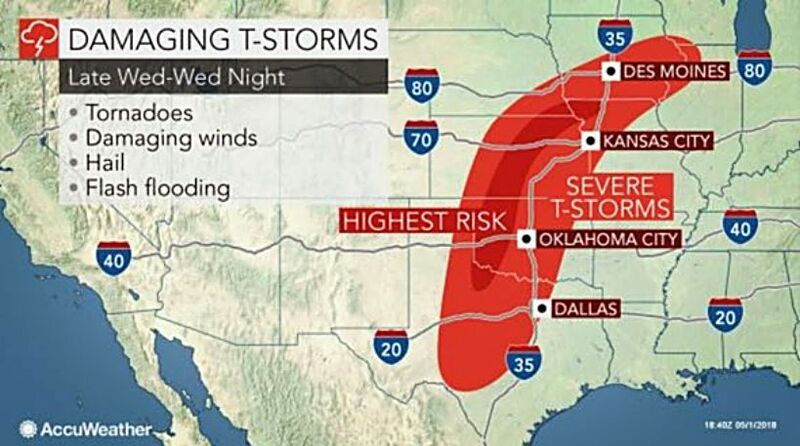 "South of I-20, severe storms may occur, but they are likely to be very isolated," according to AccuWeather Storm Warning Meteorologist Richard Schraeger. 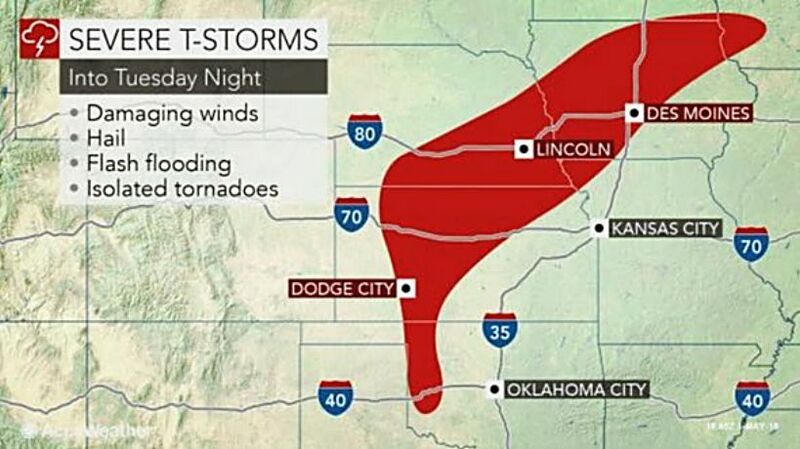 From southeastern Nebraska to Illinois, the threats may be more from flash flooding, strong wind gusts and hail. The remnants of these storms with the potential for flash flooding, frequent lightning strikes and loud thunder may reach part of the Chicago and Milwaukee areas late Wednesday night to Thursday morning. Airline passengers and motorists should expected delays for Thursday morning's rush hour. During Thursday and Thursday night, the risk of severe thunderstorms and perhaps a few tornadoes will shift eastward and extend into part of the Northeastern states. Remember to move indoors and stay away from windows at the first sign of a thunderstorm. If you can hear thunder, you are at risk for being struck by lightning. If a tornado warning has been issued for your location, move to a storm shelter immediately. If no storm shelter is accessible, get into an area of the basement near as many walls as possible in case the dwelling collapses. If there is no basement, then the safest location is a small interior room such as a closet or bathroom. Climbing into a cast iron bathtub may offer additional protection. Cover yourself with heavy blankets, cushions or a mattress if possible to protect yourself from flying debris. Be sure to put on solid footwear, such as sneakers or hiking shoes, prior to seeking shelter. Wear durable clothing. There may be shards of glass, splinters and other hazardous debris after the storm.